Kids grow up so fast…. I honestly love my job. Getting to know campers and watch their kids run around having fun all summer is one of the best ways to make a living I could ever imagine. It’s hard work and long hours during the season but I’m such a people person that it truly is the perfect fit for me and our family. This next contest submission is from a family I absolutely love seeing. They came by to visit me at the Toronto RV show recently and it just made me all the more impatient for the season to get started. You’d think after 6 months straight of 14-16 hour days with very few days off (only when I snuck off for the Tragically Hip concert) I’d be happy to prolong the break. 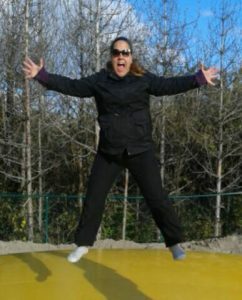 I am truly loving all the time I get to spend with my kids during this break time – but the rest of the time I’m bored silly and can’t wait to get back to “play”. 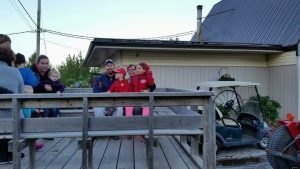 This family started camping at the Brighton KOA before we took over as new owners. 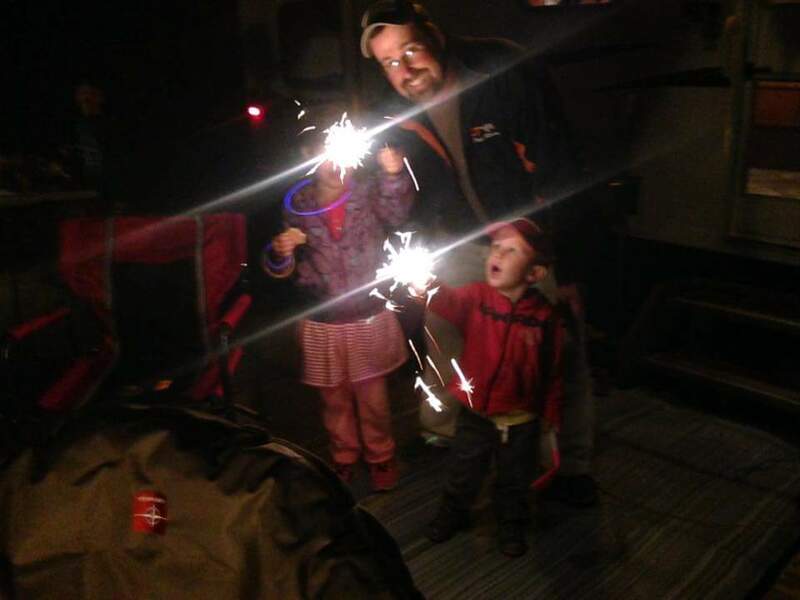 They felt that their kids were “growing up faster than we wanted to admit” so they decided to start camping to create some quality family time. They started year one in a tent trailer and after camping turned out to be a huge hit, upgraded to a bigger trailer the following year. “One with a bathroom……Ahhhhh”. 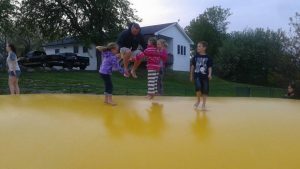 They started a tradition of opening the camping season at the Brighton KOA and once we had added the Big Bouncer they spent a ton more time here than just the beginning of the season. 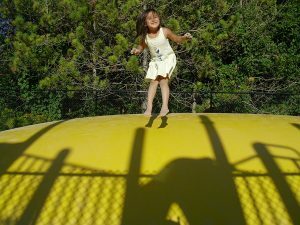 Quoting from her email “the kids literally spend all day on it if we let them and we love it because it means by the time they eat dinner they are usually falling asleep at the table from jumping all day.” You can see in these pictures that the kids aren’t the only ones jumping on it! 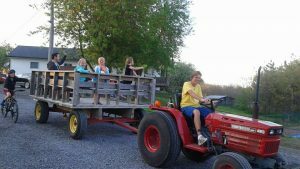 The kids enjoy wagon rides, swimming in the pool, ice cream social, scavenger hunts, movie nights and all the fun stuff we plan for kids at the KOA. 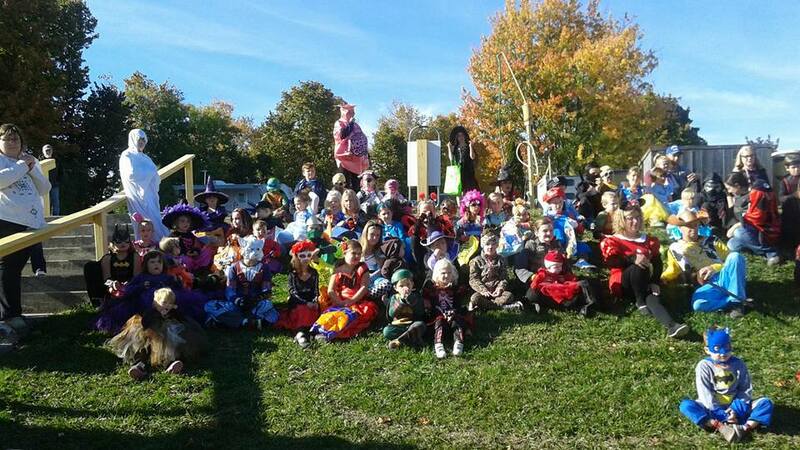 In her words, “Our absolute favourite was Halloween in the park this year. 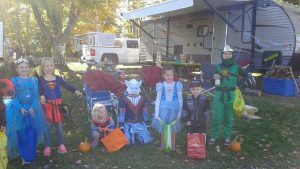 The kids are still talking about the awesome jack o lantern display, and how the tractor “broke down” and we had to run through the scary zombie trail! ( where by the way the entire group put the biggest chicken -me, at the head of the pack)”. It warms my heart to read of all the joy we are bringing to families. I know this woman was smart and booked her camping trips early. We are filling up really fast for so many of them. The May weekends especially. 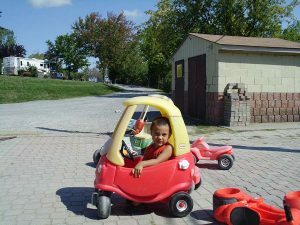 Author JackiePosted on January 24, 2017 Leave a comment on Kids grow up so fast…. DISC GOLF or what used to be lovingly referred to as Frolf. I am saving as much money as possible this year to be able to, God willing, purchase some new cabins for our 2018 season. But, I didn’t want to go a whole season without adding something new and exciting for our campers. We’ve just signed the deal for a course designer to come and help us set up a truly unique and somewhat challenging 9-hold Disc Golf course along our walking trail. If you haven’t played, I’ve been told it can be quite addicting and fun for all ages. For you dads out there, grab your beer (cans please around the campground) and some discs and head out for an hour of fun and competition. 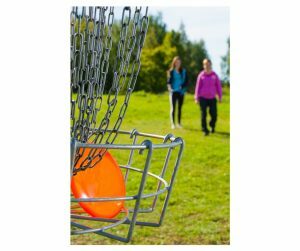 Or grab the family and all head out to get some exercise and fun while chucking frisbies at baskets to see if anyone can get a “hole-in-one”. We’ve decided not to charge green fees for anyone to play. If you need to rent discs there will be a rental charge and deposit (the deposit being returned once the discs are safely back in our care) or you can purchase your own discs in the store and continue to play all summer at no extra charge. If you want a score card there will be a very small charge for those and the pencil just to cover the expense. 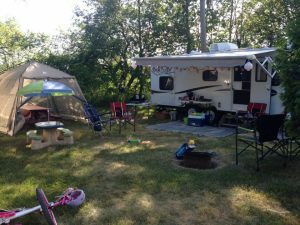 We really wanted to add value to the camping experience without it being a major expense to families – especially if you have a large family. I hope this new addition will continue to make the Brighton KOA a great camping family experience. You won’t hear Mommy I’m Bored at this campground! One of the reasons I love owning a campground is getting to know the repeat campers better. We are so lucky to have such loyal campers that come back so often throughout the season that it really gives us a chance to develop more of a friendship. I look forward to seeing their kids grow up over the years. This next camper experience was shared by one of these families I’d say was developing into a friendship. They camped with us 6 times in the 2016 season and I am really looking forward to seeing them again in 2017. One of the weekends they camped was a long weekend so you can see them having sparklers at their site in the main photo. I LOVE the long weekends because of the fireworks. Hearing everyone clap at the end of the show always makes the cost and effort worth it. 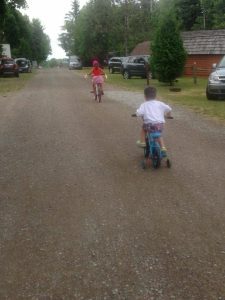 The mom, who sent me the email, and her husband have two small children and one of the things they love about our campground is that everything is fairly close and the kids know the campground so well that her and hubby can get a bit of down time together while the kids go and play. It’s nice to see them all riding together on the wagon! 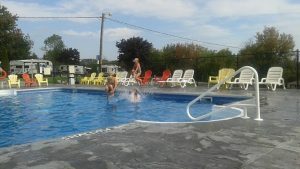 Here are some photos of them enjoying the pool. I know this is a favourite place for my kids too. We keep it heated to 84 so that the parents can enjoy getting in with the kids! They happen to live very close by so she al so mentioned in her email how great it is to pack up at home and within a very short period of time they are all set up and camping. They never hear “are we there yet?” In fact, they truly make their site a home away from home. And then she made a comment that made my heart swell because it truly is my biggest desire that we create a campground that entertains children so that parents can take a much needed break. She said that she never hears “mommy I’m bored” at our KOA. It makes me so happy to hear that. 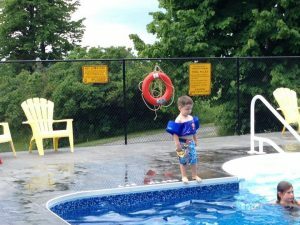 Author JackiePosted on January 12, 2017 Tags Brighton Camping, Brighton KOA, camping, full hook up sites, KOA, long weekend camping, northumberland, quinte west, RV, travel trailerLeave a comment on You won’t hear Mommy I’m Bored at this campground! Brave Grandmother tries camping for the first time! 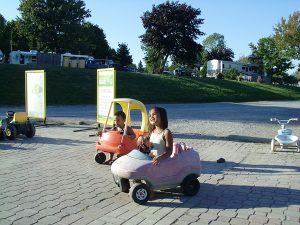 I am truly enjoying spending time reading all the emails I’ve received with stories of your camping experiences at the Brighton KOA along with seeing all the photos you’ve included. So thank you for sending them along. KOA gift cards are being given out for each entry I use in my blog. They can be picked up at your next camping trip with us. 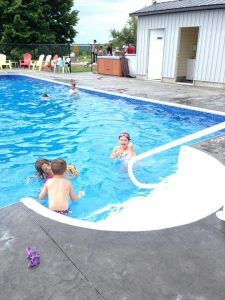 This weeks entry is from a wonderful grandmother of 2, a four year old and a two year old! It was inspiring to read her story because she admits in the first line that she hadn’t ever been camping before and “wasn’t that keen on it” but agreed to go because her granddaughter wanted her to go. Their mother suffers from a gout like condition and wouldn’t be able to enjoy all the activities. 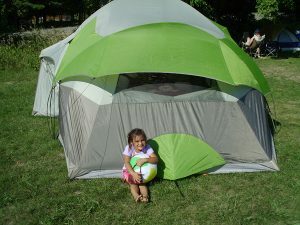 So, on the September long weekend, right before school started for the eldest, this brave grandmother went on a camping adventure – tent and all! She shared with me in her email that she was reluctant at first because she didn’t want to sleep on the ground or experience mosquitoes and especially was worried about missing out on her luxuries like a bath or a stove to make her tea. Well, with a little preparation she said that she was actually quite warm in the tent under some extra blankets. And she wasn’t bothered by a single mosquito while enjoying the campfire! She also was glad she didn’t have to give up her tea because we had it available at the store anytime she wanted one. She told me her granddaughter was excited to collect stickers in her Passport to Fun and wanted to do all the different activities we have available – from the Big Bouncer, to swimming in the pool, playing on the riders in front of the store, watching fireworks, going on the wagon ride and eating Ice Cream at the Social. From the sounds of it, this family packed their weekend with all that we have to offer and enjoyed every minute of it. I’m impressed that a grandmother would take on the challenge of her first camping trip at 65 years old and I am so glad that we were able to make it so great. 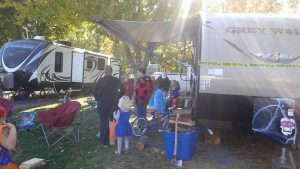 Author JackiePosted on January 5, 2017 January 5, 2017 Tags Brighton KOA, camping, Kampgrounds of America, KOALeave a comment on Brave Grandmother tries camping for the first time! Rates and how they affect you. I can’t believe the season is over in three more weeks!!! !